Has your oven bulb glass cover cracked or fallen off? If your oven bulb is now exposed to the full heat of the cooker, it may not last much longer! Your oven manufacturer is probably asking silly money for a replacement glass lens or worse, a full light fitting. Well this OEM glass lens cover will fit hundreds of makes and model of cooker at a fraction of the original cost. 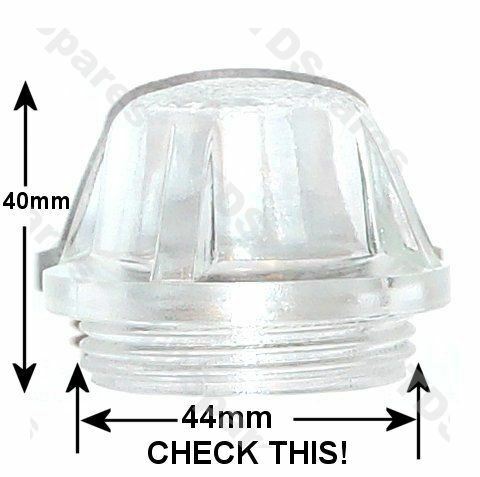 The Thread Diameter is 44mm across, so please check this before you order, just to be sure. *Thread Diameter Is 44mm and SCREWS IN, this is not a bayonet type fitting - Please check this! *Will not replace 33mm or 60mm thread diameter or bayonet type glass lens- please see alternatives tab above. SPECIAL OFFER - Buy 2 for only £18.95! Choose from the drop down menu in price box above.